George: WARP Book 2: The Hangman’s Revolution by Eoin Colfer was released this summer and I was thrilled to get my hands on it. The first book in the series, WARP: The Reluctant Assassin really impressed both of us and our review on Communicore Weekly discussed some of our favorite aspects of the book, including time travel. It really was an ingenious set-up for a new series and we both wondered how and when Colfer would take it in the future, so to speak. You can listen to our review of WARP: The Reluctant Assassin, here! Jeff: Colfer has been one of my favorite authors since his Artemis Fowl series, so I was excited to see him really jump into something new. The Hangman’s Revolution doesn’t disappoint at all. Picking up where the first book left off (sort of), we quickly learn that time travel has its consequences, whether or not you are the direct cause of changing the future. It’s an interesting premise (which had me re-reading the end of the original book again) that sets the story into motion. George: The premise of the first novel is that the FBI is using time travel as a witness relocation program. The FBI takes a person of note in a court case or one that needs to be protected and they spirit them to the past. As we find out in the first book, strange and undesirable things can happen when things get all wibbly-wobbly… timey-wimey… stuff. The Hangman’s Revolution starts of pretty strangely and I felt really out of context with the story. I’m a huge fan of Eoin Colfer, so I was surprised that the first 40 pages or so were so disconcerting. Maybe it was on purpose. Jeff: Looking back, I definitely think it was on purpose. Chevie Savano, one of the main characters, is out of place and out of touch with the “world” she returned to after the events of the first book. She remembers things quite differently (as do we! ), and she is awfully confused. That definitely made the reader fit into her shoes, because we felt just as disoriented as her. However, as things begin to pick up, the story builds its steam and regains its footing, and becomes a fantastic time-travel adventure. George: One of the things I really liked in the book were the quotes at the beginning of each chapter, by Charles Smart, the inventor of this form of time travel. It really helped to ground the story for me and point out that time travel might not always be safe. They were also very Doctor Who-ish. In addition to Chevie, we run into King Otto and the main character from The Reluctant Assassin, Riley. Of course, there are also a pair of Thundercats. Jeff: Yes, Thundercats is what he said, folks. You see, as part of the alternate future that Chevie and Riley unknowingly create, there are a bunch of pop references that come up as part of Box’s master plan. Who is Box? Why, he is the antagonist this go round. And quite an antagonist he is. You see, he was a man from the future, who was thought to be lost in the past. When he emerged and took over with his future technology, he basically created a religion about himself, and thus, everyone in the future treats him as God. To be honest, for a kid’s story, the end raises a lot of very interesting and deep questions about religion and the effects it has on a society, along with the origins of religious stories. 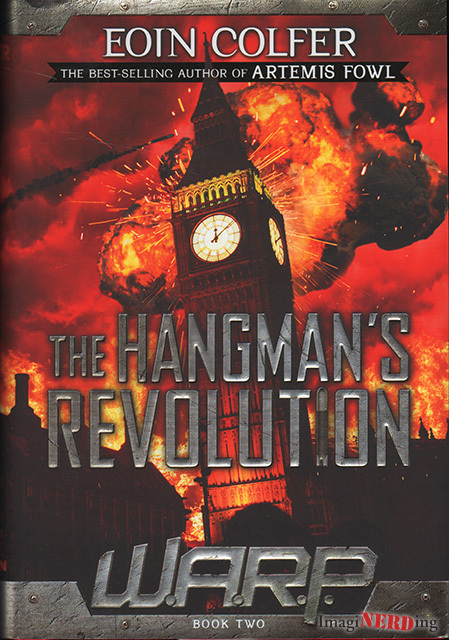 George: The Hangman’s Revolution is really quite a spellbinding story that is full of twists and turns. Colfer weaves a very deft tale that is more than just a page-turner; there’s a sophistication and intelligence that is the hallmark of really good fiction. The characters have a very human element and London plays as important a role as the characters, themselves. Just like in The Reluctant Assassin, Colfer does an amazing job of painting a sepia-colored London that’s not as romantic as you might think. Jeff: It’s very real, and it’s very gross. And it’s definitely not what the Thundercats had their mind filled with about their beloved leader before they unwittingly arrived there. All in all, the book was a really good addition to the series, and I’m excited to see where Colfer takes it next. I hope he is able to keep this level of action and fun for the rest of the WARP series. George: Even though this series is geared towards tweens and teens, most adults that enjoy fast-paced and well-written stories about time travel will love this book and the WARP series. As Jeff mentioned, we’re both really excited about it and urge you to pick up a copy. Jeff: We also have the minds of 15 year-olds, so it really is up our alley. Did you read The Reluctant Assassin? Are you going to delve into WARP Book 2: The Hangman’s Revolution?